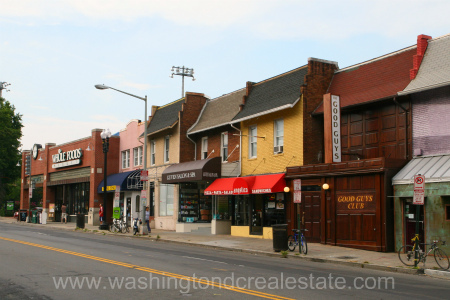 Glover Park is a residential neighborhood located north of Georgetown in the northwest quadrant of Washington, DC. The community is surrounded by two lush, green parks -- Glover-Archbold Park and Whitehaven Park, which are each branches of Rock Creek Park. In fact, Glover Park is named for Charles Carroll Glover, an early 20th century banker who helped drive the development of Rock Creek Park. Besides the easy access to open, green space, Glover Park is also known for its vibrant commercial corridor which includes a number of popular restaurants, many of them offering ethnic fare. A Whole Foods Market and the Washington Sports Club further anchor the commercial area. Glover Park is also home to several embassies, including the Embassy of Russia (legendary for its rumored underground tunnels) and the Visa office of the Chinese Embassy. Glover Park properties include row houses set back on tree-lined side streets as well as condo developments along Wisconsin Avenue. Glover Park is bounded by Glover-Archbold Park to the west, Fulton Street to the north, Wisconsin Avenue and the Naval Observatory to the east and Whitehaven Parkway to the south.